I like crocheting because it is such a easy and small project to bring when you are crafting away from home. And since I make these swirly scarfs from a pattern I now store in my head, I don’t need to read any directions. I just bring a ball of yarn and a hook and keep going til the mohair is finished! The snow is all gone, so Christmas feels far away… but I’ve put up my stars garland in the living room tonight. So beautiful and cozy – I’ll try to take a photo and post later. I’m also looking at this video over and over again. I think I might try to make a kanzashi flower! 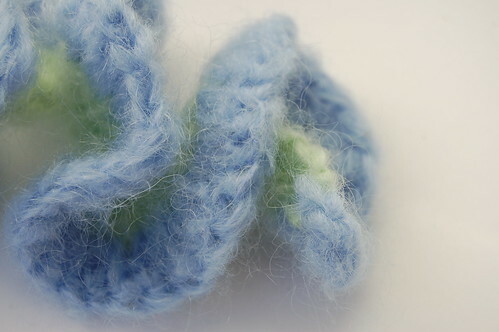 This entry was posted in Crafts and tagged crochet, scarf. Bookmark the permalink. Can you do a tutorial on this crochet scarf, or direct me to the pattern? It looks super in the mohair! Thanks, Gill (in Norway). 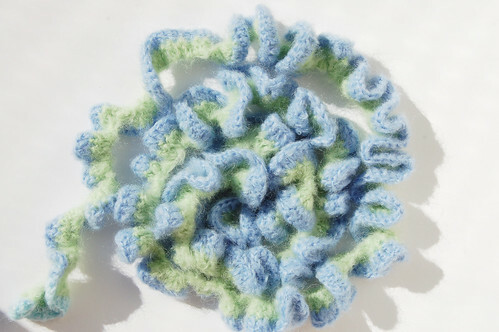 Crochet is great because it is so portable – and no worries about losing stitches either. I love kanzashi flowers, but I am not brave enough to try one yet! Thanks or the link to that video. I am at work and I had a paper napkin right beside me. I tried folding it – it#s really easy and looks good! how funny…earlier today i was thinking of ribbon candy that we always used to have at Christmas when i was a little girl…these scarves look just like ribbon candy to me! :) Absolutely beautiful!
? ?h, fina sjalar, finns det n?gon m?jlighet att f? ta del av m?nstret? I don’t have the pattern, but a similar one can be found at Garnstudio, in swedish here, in danish here and in norwegian here! Good luck! S?ljer du dem i shoppen? M?ste kolla!